I was having a conversation with my friend Patrick the other day on the concept of free will, the movie Inception and the question of where ideas come from, and I realized that people overestimate the frequency and effect free will plays in their lives. I'm not arguing against free will, nor am I saying that free will does not have a major impact in the course of a person's life, what I am saying is that many of the decisions in our day to day life do not involve conscious choice. Even though we get very uncomfortable with the thought, humans are still animals. Smart animals, tool using animals, creative animals, but still animals. And this means, as animals, we are, to a large extent, controlled by stimulus-response. The most basic stimulus-response is the reflex; a doctor hits your knee with a rubber mallet and your leg pops up. It is involuntary and automatic, you have no control over it. In fact, if it does not happen, it is a primary indicator of something being severely wrong. a horse can walk from instinct, we have to learn. Yet, we have an instinctive drive to reproduce, to attempt to survive a deadly situation, to suckle as a baby, and so on. Many phobias are rooted in instinctual fears, and may actually be examples of instinct run amok. The next level is a form of learned behavior that still is completely a stimulus-response, and that is the world of the motor skills. If you think deeply about how to walk or ride a bike, you can't do it. Similarly, playing an instrument also requires what could be termed muscle memory. A person cannot focus on how they do what they do and still be able to be skilled at it. Most of our motor skills fall into this category, and even some cognitive processes as well. We do not add two plus two in a conscious cognitive process, answering the question is almost a reflexive response. In fact, according to Lakoff, all arithmetic up to about the number four is purely instinctual. It's called subitizing, and even human babies seem to be capable of this sort of math. Learned behavior goes beyond muscle memory and motor skills, but still lacks the spark of free will. You are trained to behave certain ways in certain situations. Children learn not to touch a hot burner, how to make their parents happy or angry, how to navigate complex social interactions. Our cultural imprinting guides our behavior. Even "book" knowledge filters into learned behavior as added information for the response to the stimulus. For example, if a girlfriend cheats on you, you are less likely to trust your next girlfriend. In fact, you might go through her purse, phone and e-mail on a regular basis because you have lost your ability to trust while in a relationship. You might even watch Divorce Court or Jerry Springer and find rationale for your crazy behavior. I am not excusing that behavior, but I am saying that it is a learned stimulus response and one that many people and one that many people don't, or can't, control. And this is how most of us operate for the majority of our day to day lives; we go though the motions, careening from stimulus to stimulus, and responding, not with consciously directed choice, but with the same sort of behavioral patterning that is found in all animal species. We can even see this is brain scans that show that we have acted before we actually decide to act. We are creating a fiction of decision making, when in actually, all we are doing is what can be termed post-facto rationalization to explain a "decision" that really is just an autonomic response. So is this all there is? Are we doomed to be no more than all of the other animals, reacting to stimuli and then rationalizing that response to try to make ourselves feel better about being an animal? To be honest, you could argue that the answer is yes, but I don't think so. I think this is the place that free will comes into play. Free will operates in a few scenarios, primarily in the Inception question of true creativity and spark of genius, and in the life altering "Turn Left" scenarios. 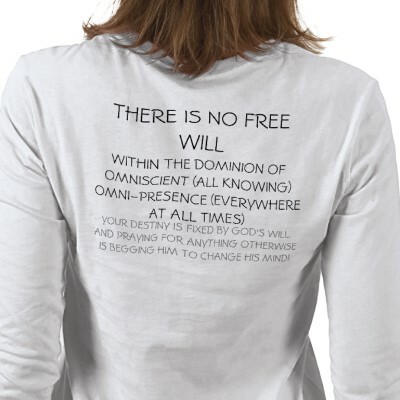 In previous blog posts, I have discussed the Fundamentalist Christian idea that we are given free will only to give it over to God, which I think is the easy way out, but that is an example of the "Turn Left" scenario. The term "Turn Left," comes from a Doctor Who episode by that name. In the episode, the Doctor's companion is shown how the universe would have been different if, on a certain day, she had made a left turn and skipped a job interview, rather than turning right and going to the interview. Free will operates in the "Turn Left" scenario by allowing you to change the path of your life. You can choose to not follow your imprinted behavior, and by extension, rise above the animal part of your nature. In the example of the cheating ex, free will would allow you to rise above and move beyond the trauma, and not run around like some sort of stalker, checking up on your current girlfriend. Free will, in this case, beaks the chains that bind our conscious mind. A couple of examples of spiritual traditions that draw on the free will doctrine are Freemasonry and Buddhism. Freemasonry asks a person to "learn to subdue (their) passions and perfect themselves in masonry." Learning to control the passions, the animalistic side, and being conscious and thoughtful of our actions, connects us to the power of the Will. Rosicrucianism takes this thought even further, examining the power of the Will to alter the world. It is the alchemical crucible, wherein we become perfected by consciously choosing to become better than we are. Buddhism looks at free will differently. This journey teaches that all life is an illusion, and by coming to terms with that, you submerge yourself in the divine. This is a gross oversimplification of the spiritual path of Buddhism, but is sufficient to get the point across. This path teaches that all desires are nothing more than illusion, and to grow, you must release those illusions. Even the flesh is an illusion. There are Buddhist monks who can, by force of will, alter their body's internal temperature and make a wet towel steam in a cold room. They can change their heart rate, control pain and change many other things in their bodies by a willful decision. They inhabit their bodies, not as passive observers, but as active contributors. This is what Ellen Langer terms "Mindfulness," and opens the door to conscious living. The other aspect of free will, which is the one that I think may be even more interesting, is the concept of genius. This is looking at the question of where ideas come from, from exploring the realm of imagination. Before we look at Inception, we must understand creativity. Creativity has two components, innovation and appropriateness. If one of the two is missing, the solution, no matter how good, is not creative. An example of this is the picture of a snowstorm where a group of elementary school students are asked to draw a picture of their house in a snowstorm. One child draws a perfect, almost photographic, image of their house with it snowing. This is not creative, because, while it is appropriate, it is not innovative; the child drew exactly what was expected. The skill of the rendering is irrelevant for this aspect, because it lacks innovation, nothing new, outside of the already learned skill set is employed. A second child hands in a blank page, saying that it is snowing so bad you can't see the house. That is innovative, but not appropriate; the child did not perform the task that was required. Even though the solution is unique, it does not actually solve the problem at hand, it sidesteps it. A third child draws an impressionistic view of their house in a snowstorm, that focuses, not on the literal, but on how it feels at their house when it snows. That is a creative solution to the problem, it is appropriate, because they have done what they were asked to do, but it is also innovative, because the task was accomplished in a unique way. I'm not going to ascribe the spark of genius to a purely metaphoric scenario, but this sort of creativity approaches the realms of free will. It is Inception, not in the literal movie sense, where an idea was implanted, but in the sense that an idea becomes almost extrapersonal, arising from outside of the well worn neural net pathways. Synthetic thinking, which is the ability to take disparate information and create a cohesive solution drawing from divergent sources is a cousin to the Genius, but it is still rooted in the animalistic stimulus response, because pattern making is hard wired into us. True genius exists outside of this, it is the solution that arises, like Athena, fully formed from our brow. It is not a flash of insight, not a weaving of connections, but a sudden, true innovation, that is a appropriate solution to the problem at hand. It is very rare; there are probably only a few genuinely new ideas every decade, but these new ideas become the greatest achievements. And then free will allows us to put aside our preconceptions, the expected, and embrace the genius. Free will does not create the genius, it allows us to accept it. In this case, free will is the ability to change the world.